Well this week has flown by. My little boy has been sick for a few days, so my usual routine has been interrupted. I absolutely don’t mind the interruption, and like having him home with me all day again, but I just hate it when my little ones are sick. Since he hasn’t been eating a whole lot (sore throat), I’m so thankful to have frozen broth at the ready for both the ease and the nourishment that it can give to him. I guess this is as good a time as any to post this recipe, then. 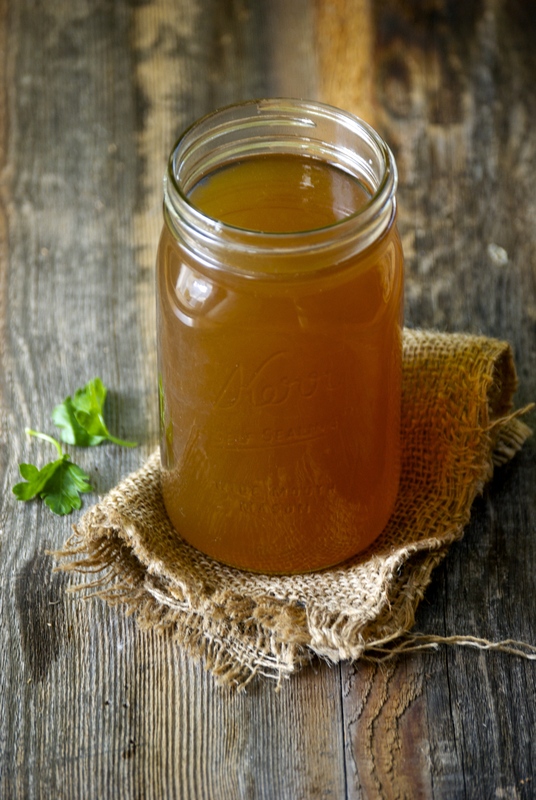 Making broth isn’t a new concept, but it seems as though the foodie/health world has rediscovered it lately. There’s a good reason for that. Making broth is simple and it offers so many healthy benefits that store-bought versions simply do not. They also taste so much better. 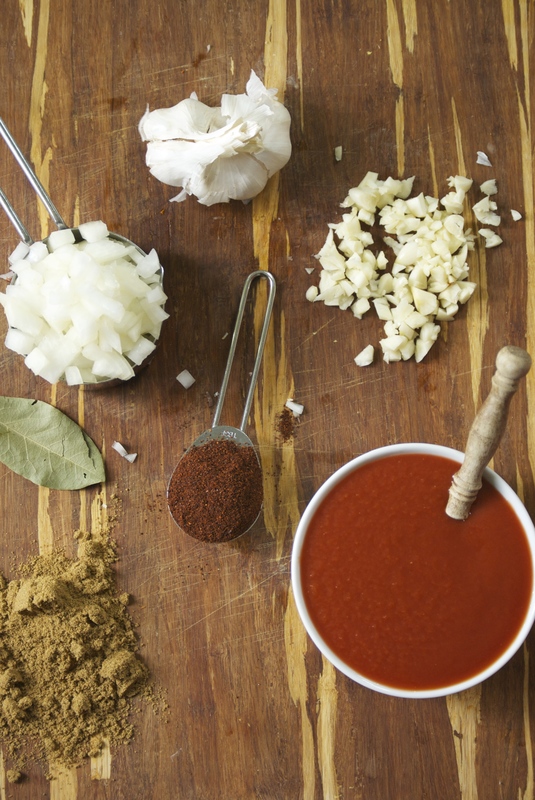 Make a homemade broth and then do a taste-test with a store brand. I have. The difference is stunning. For my beef broth, I start with finding some good, properly-raised beef. You know I’m a grass-fed beef advocate. 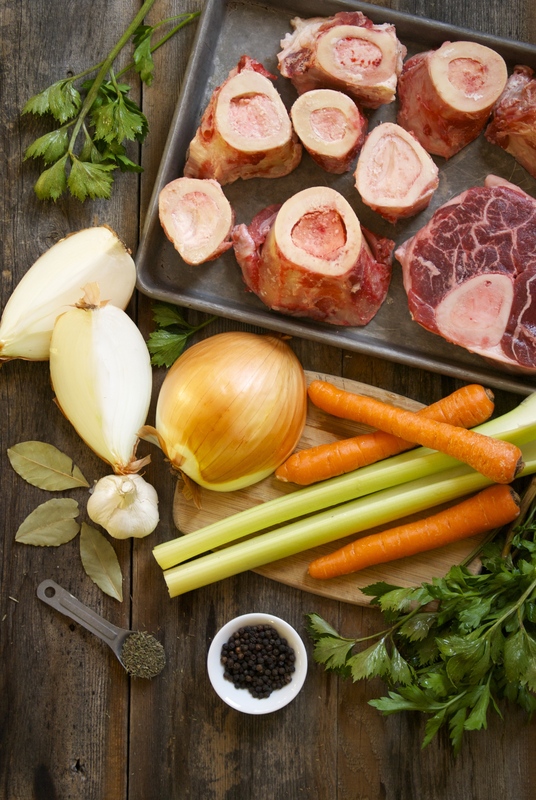 So, I suggest you find some grass-fed beef bones (you’ll want a mix of marrow bones and some with a bit of meat on them) to make the healthiest, most nourishing broth possible. Soup bones can easily be found at a good co-op or grocery store, your local butcher, or from the farmers market. They’re cheap. Sometimes they’re even labeled “pet bones”– which is kind of odd. But trust me, they’ll make a rich broth that you’ll love. The other ingredients you likely already have at home– carrots, celery, onion, garlic, cider vinegar, and some dried or fresh herbs. 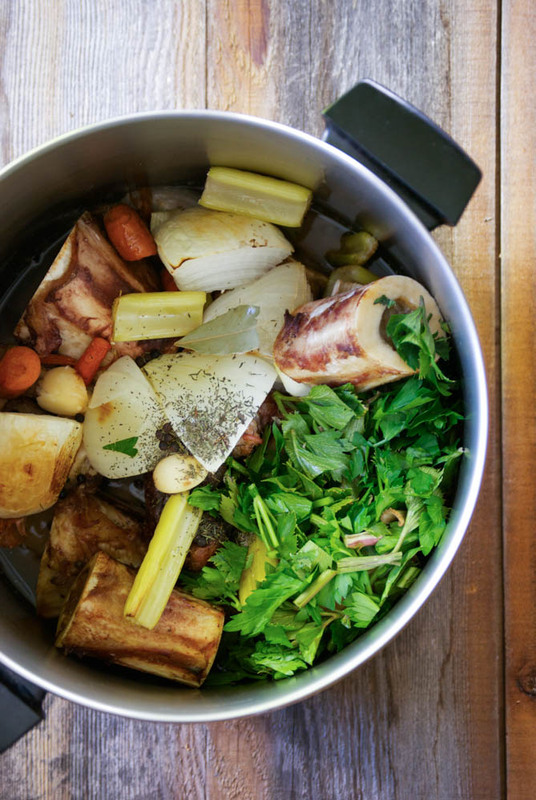 It’s a simple process that involves roasting the bones and vegetables first– to really amp up their flavors– then simmering on the stove for hours with water, herbs, and vinegar. The vinegar is added to, supposedly, draw out some of the minerals from the bones. I’ve read conflicting information on this, but I finally decided that since I love the flavor it imparts, I’m going to go with it. Simmer this broth as long as you can. The longer you do, the more nutrients it will draw out of the bones. 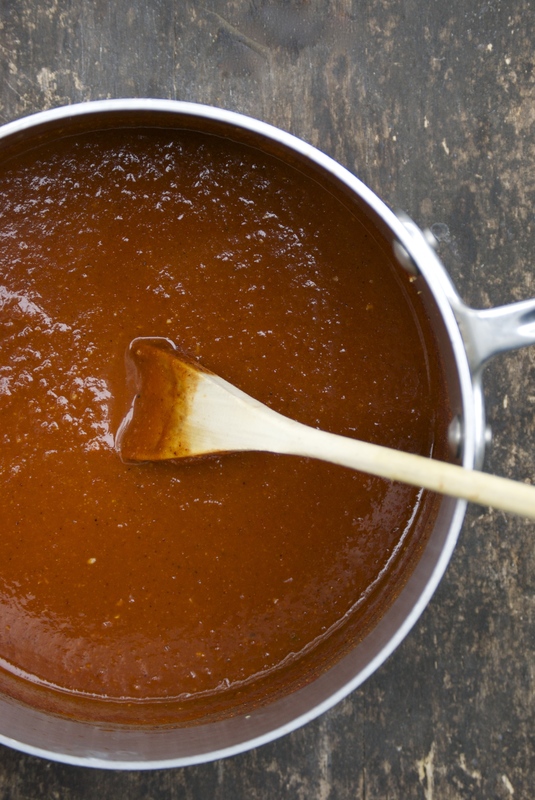 The flavor will be good after three hours, or so– but shoot for 8 or even 24, if that’s a possibility for you. Also, after simmering for about 2-3 hours, I remove the bone with meat on it, and trim the cooked meat off. I put the bone back into the broth and save the meat to use another time. At this point it hasn’t been overcooked, but it has still added plenty of flavor to the broth already. If you don’t want to bother, just leave it in the broth for the duration of the time. As long as you hit that three-hour mark, the broth will taste amazing! 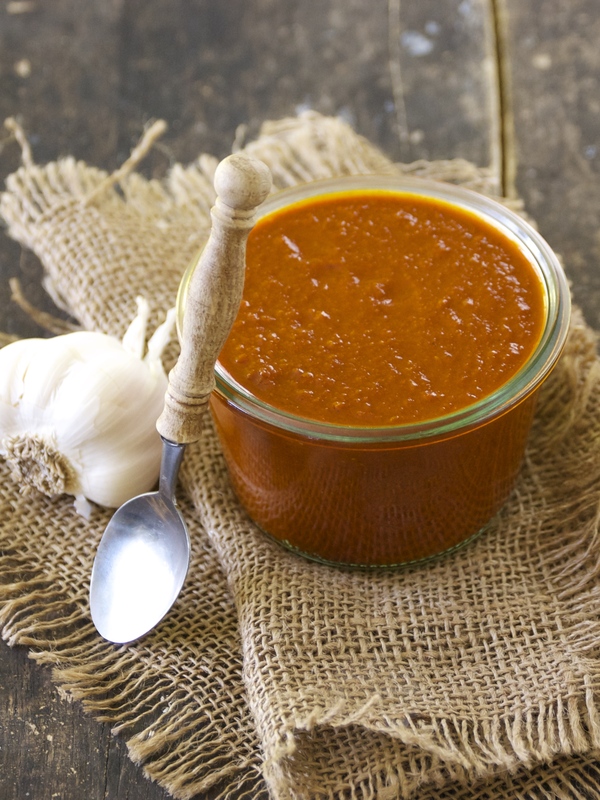 Use it in soups like this Paprikash that is one of our family favorites. 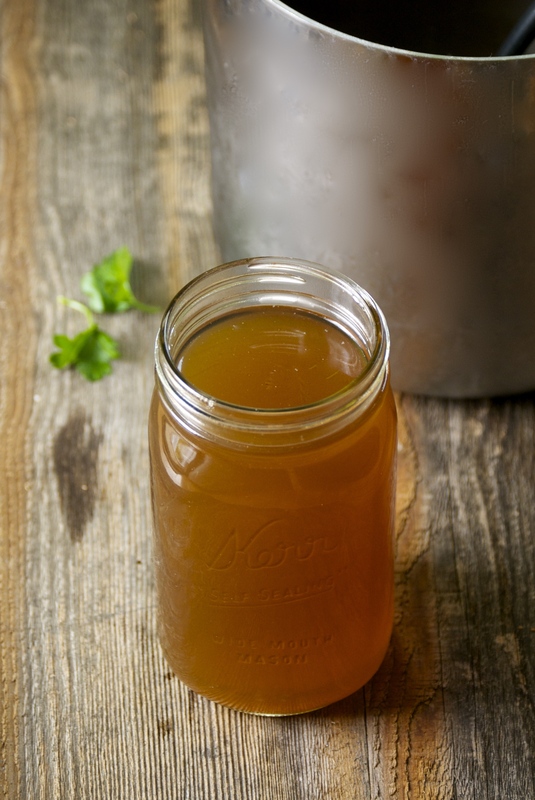 Fill your freezer up with both this beef broth and this chicken broth for quick, healthy soups this winter. Preheat oven to 400°F. Line a rimmed baking sheet with parchment paper (for easy clean-up). Place the beef bones, carrots, celery, onion, and garlic on the pan with a bit of olive oil and a sprinkle of salt. Roast for about 40-45 minutes, or until the beef and vegetables have a bit of color. Remove from oven. Add the beef, vegetables, and any juices (leave the grease behind) to a large kettle. Top it with the bay leaves, thyme, peppercorns, fresh parsley, cider vinegar, and enough cold filtered water to cover it all. Bring everything to a high simmer so that it’s almost boiling, but not quite. Then reduce the heat with the lid ajar to just a low simmer that is barely bubbling and let it cook away for as many hours as you can. Three hours for sure, but shoot for more, if you can. 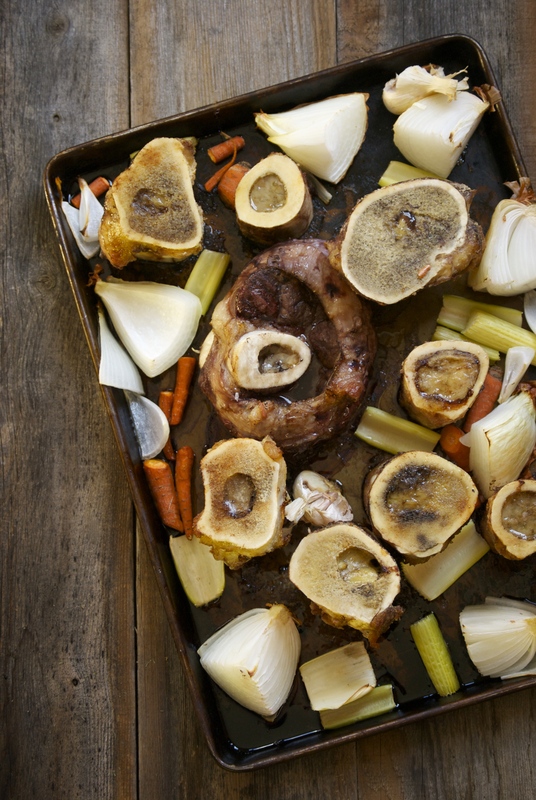 If wanting to use the meat from the meaty bone (and you should– it’s great for quick meals and/or snacks), remove from bone after about 2-3 hours, put the bone back in the pot. 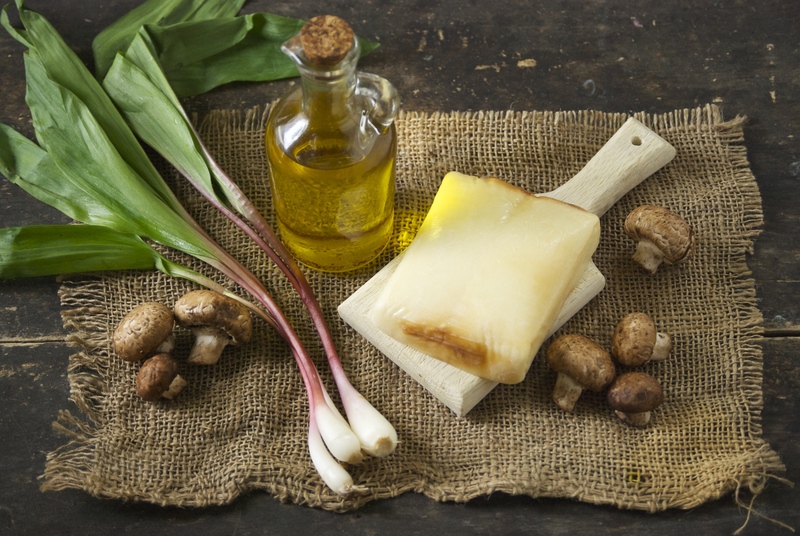 After you have finished simmering the broth, remove the large pieces with tongs and strain the liquid through a cheesecloth. This will give you a nice clear broth. At this point you can put it in jars (or BPA-free plastic quart-sized containers) leaving about an inch of head-space (the liquid will expand as it freezes) or leave it in a large pot and refrigerate until completely cold (this will take hours, so overnight works well) and pour into jars afterwards. This makes removing the top layer of grease a cinch. Once that has been completed, throw a lid on it and freeze. I try not to describe things as “the best” too often. I’ve done it from time to time, but when I do I truly think the recipe deserves that title. This margarita? It’s the best. Full stop. 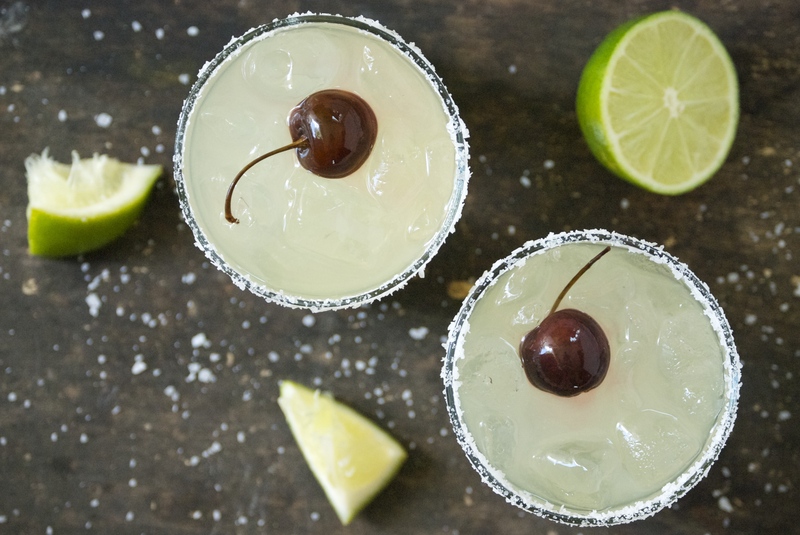 Ditch the store-bought margarita mix, because it doesn’t even come close. And once you make this sublime cocktail, it’ll be the measuring stick against which you judge all others. There, how’s that for a recommendation? 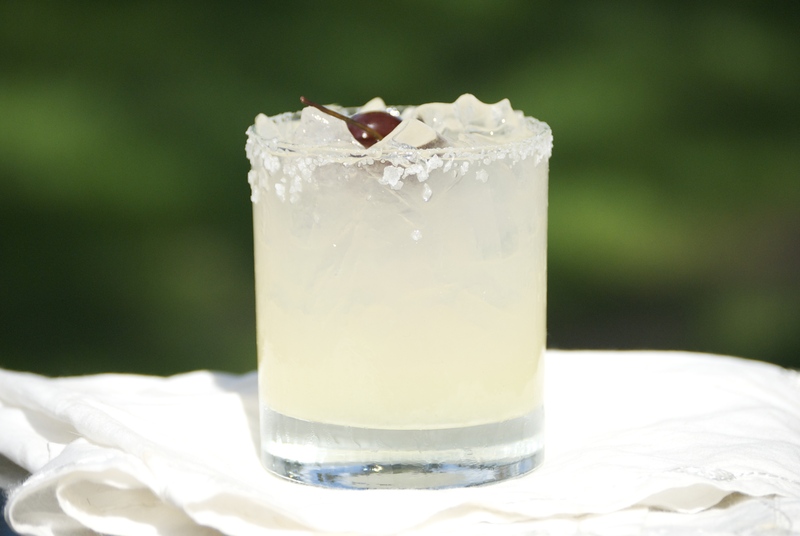 I’d been planning to make these margaritas for a gathering of some of our dearest friends this past weekend. We’re a group that has been close since our early college days, but as is often the case, it’s just difficult to get everyone together as we’ve become adults. It was fantastic being able to sit in the back yard sharing stories, drinking margaritas and eating tacos (more on that in another post), and watching all of our kids run around. Summer at it’s finest. Now to the margarita. This one requires a little planning, but don’t let that scare you off– it’s easy to make. What it doesn’t involve is a long list of strange or unpronounceable ingredients. Lemon, lime, sugar, and a decent mid-price tequila. The reason it tastes so damn good is due to the time you should let the flavors meld together in the refrigerator. I did it for 24 hours (actually a bit more, to be honest). 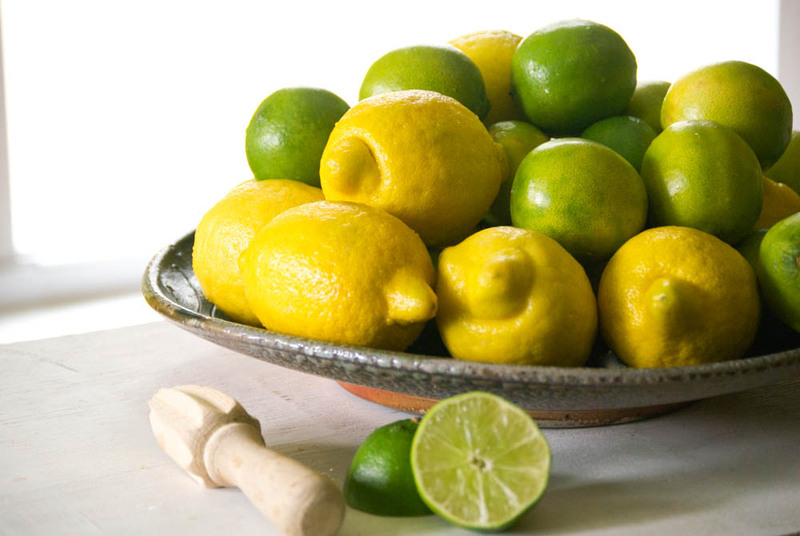 The lemon, lime, and sugar really have a chance to become one– it takes on an entirely different citrus when you give it the time. If you’re short on time, four hours will probably work. Just remember the longer it sits, the better it will be. I’m planning to keep some in my refrigerator throughout the week, so it’s at the ready when I fancy a good margarita. Which means I’ll probably be having one every night. Nothing wrong with living a little, right? I also made those cocktail cherries that crown the drink– I’ll share that recipe soon, as well. Note: We tripled this batch. The juice mixture fit nicely into a quart jar and then a large glass pitcher when we combined the alcohol and served it. As long as the ice is not combined directly into the pitcher, leftovers can be kept in the refrigerator and used when you want. Combine all of the ingredients into a pint jar, except the liquor. Shake and refrigerate for at least 4-24 hours (or longer). 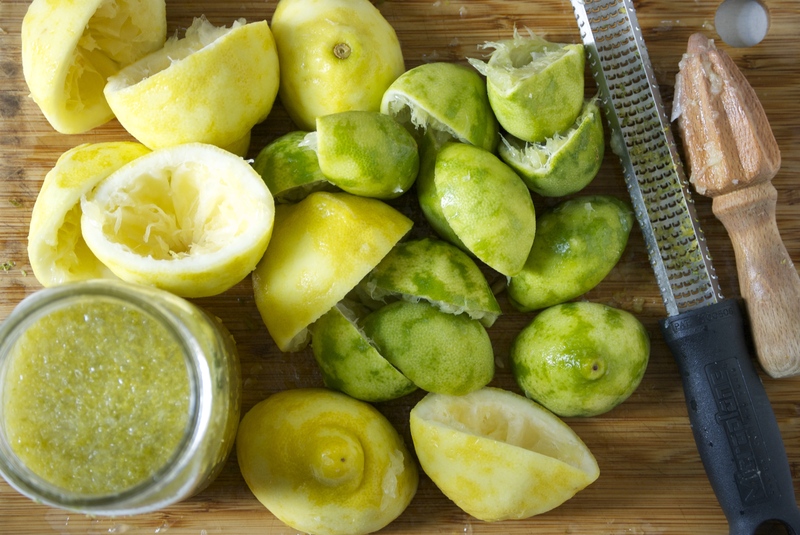 When ready to serve, strain the mixture into a serving pitcher (this will remove the zest) and add the liquor. Stir. 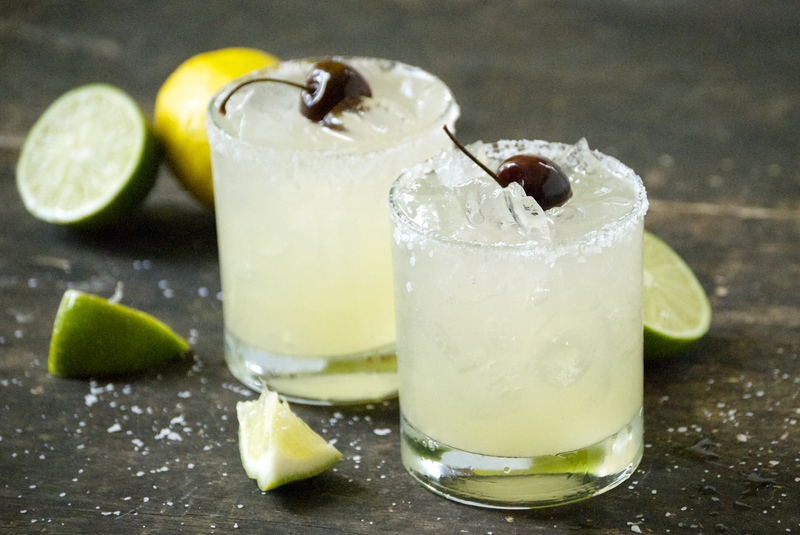 Serve in a glass that has been prepared using lime around the edge and dipped into margarita salt. 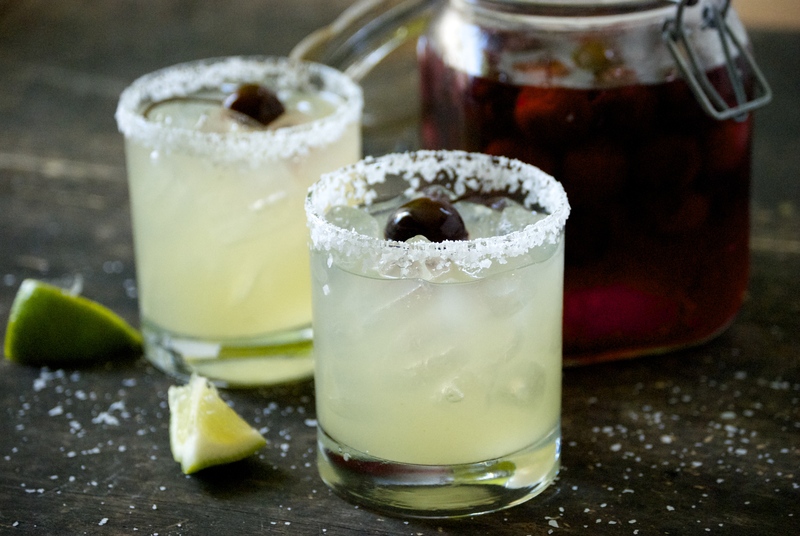 Fill each glass with ice and pour the margarita mixture into it. Add a cocktail cherry, if desired. Cheers! When the weather changes, I find that my methods for cooking change, as well. I’ve mentioned before that we live in an old Victorian house (110 years old to be exact). We do not have central air, so we make-do with our window units. When it’s a scorcher of a day, I generally avoid using the oven because the air conditioners just can’t keep up. And this happens often during our Minnesota summers. Honestly, sometimes it’s even too hot for me to stand next to a grill outside. I’m painting quite a lovely picture of the hot mess that is me during the summer, aren’t I? I’m not a fan of the heat, but I try to cope. I love summer pizza, but since I’m unwilling to endure the added heat of firing up my pizza stone– at 500°F for thirty plus minutes– I turn to this skillet method. A pizza loaded with fresh herbs, fresh mozzarella and all of those fresh tomatoes is my thing. 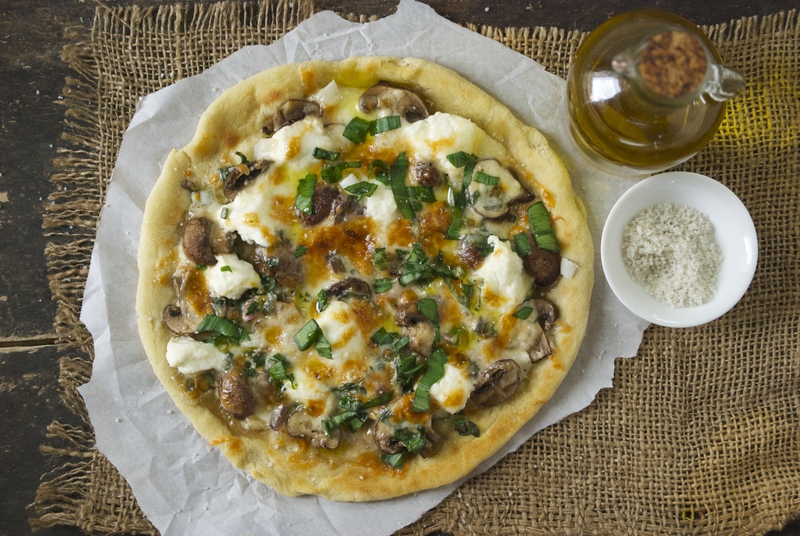 I used ramps, mushrooms, ricotta, and smoked mozzarella for this version, but you can use whatever you prefer. If you can get your hands on some morel mushrooms, please do that and think of me when you eat it. Please. I’m very particular about my pizza crust. If it’s not perfect, it’s not worth my time. I like a nice crunch on the outside, tender on the inside (NOT doughy), and a lovely deep flavor throughout. Over the years of making homemade pizza I learned something about myself– the longer the pizza dough hangs out it my fridge, the more I like it. So, I never make pizza dough the day I want to eat it, and rarely even the day before. I make it a few days prior and the flavor develops beautifully. The texture is spot on, as well. It’s loaded with air pockets from the yeast. 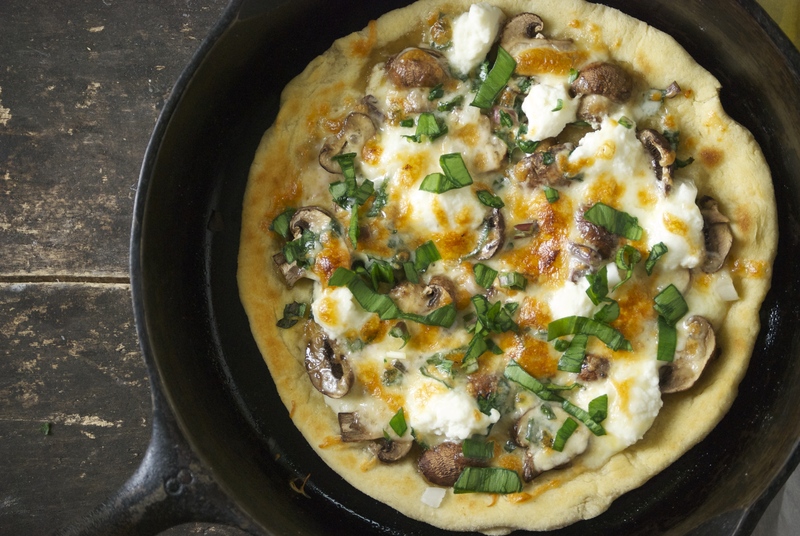 Using a cast-iron skillet works wonderfully for making pizza. Use whatever size you have. I have an old 10-inch. Coat it with olive oil and let it heat up. Then place the rolled-out dough in it. Let it cook just a bit until it has a light golden color. Add more olive oil, if necessary and flip it over. Add the toppings and cover with a lid. Cook over medium-high heat until the bottom of the crust is the color that you desire. I like mine a little on the dark side. When you get there, place the skillet (no lid) directly under the broiler for a few minutes to darken up the cheese (this will go quickly). Watch carefully, as broilers tend to be finicky. You may even need to move the pan around for even browning. Remove when pizza is a deep golden brown. The entire process takes no time at all and you’re left with a delicious pizza that has an incredible crust. Speaking of the crust– I jump back and forth from using two favorite recipes. This one, which I’ve previously blogged about and the one I’m sharing today. They are both fantastic. Whichever one you choose, just try to make it a few days in advance– it really does make a difference. I like the crust recipe I’m sharing today because it fits wonderfully into a gallon-sized ice cream bucket and because it’s ridiculously easy to mix up. Dump, stir, done. You may not use the whole thing in one sitting, but you can either use it within two weeks, or even freeze it in plastic bags. Enjoy the pizza! Begin a few days in advance by preparing the pizza dough. 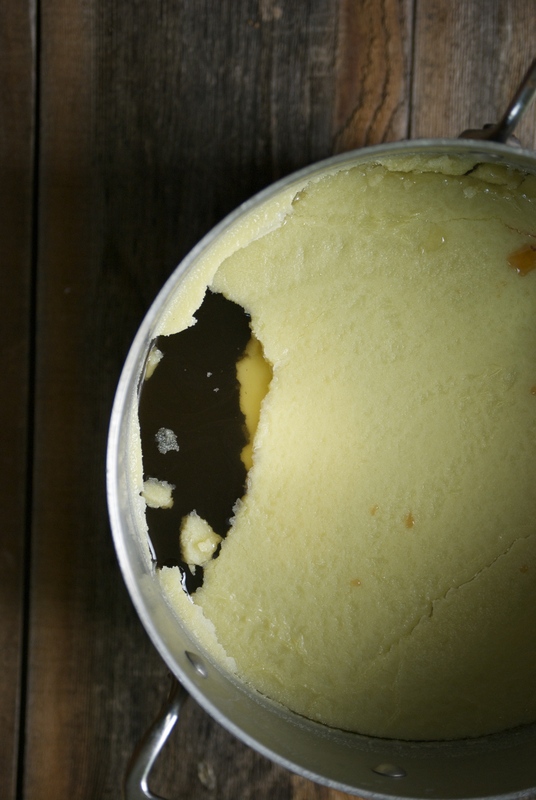 In a gallon-sized ice cream bucket (or anything of that size that has a non-airtight lid) add the heated water, yeast, salt, and olive oil. Use a Danish dough hook or a wooden spoon to mix everything together. Then add the flour and give it a really good stir using the hook to really incorporate everything. You’ll want all of the flour to be wet. The mixture will look shaggy. Cover with the lid (I use a nail to poke a tiny hole in the top of mine (this lets the gases escape when it’s refrigerated). Let it rise at room temperature for two hours. Do not ever punch this dough down. Technically, the dough could be used at this point. But, this particular dough works better when cold. And tastes a whole lot better after a night or two in the refrigerator. 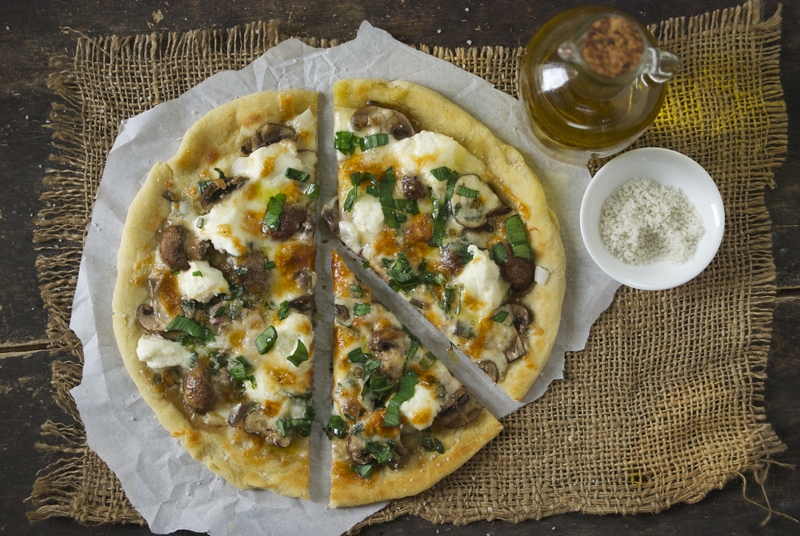 When ready to make a skillet pizza, remove some dough from the refrigerator and let it warm up for a few minutes, as it is easier to work with. Dust some flour on the counter and a bit on the dough (don’t be shy with the flour). Form a ball. 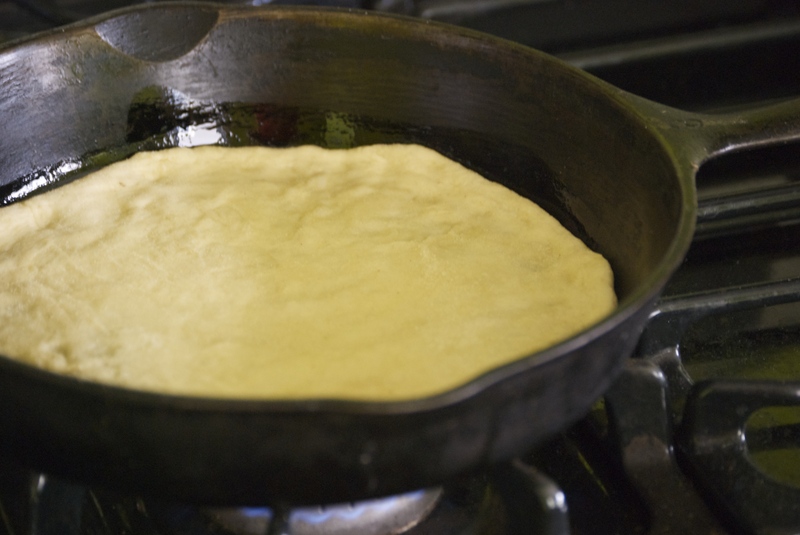 Roll it out to the size of your skillet (if it doesn’t roll easily, just let it rest for a few minutes). Coat the skillet with a bit of olive oil and heat it over medium-high heat. 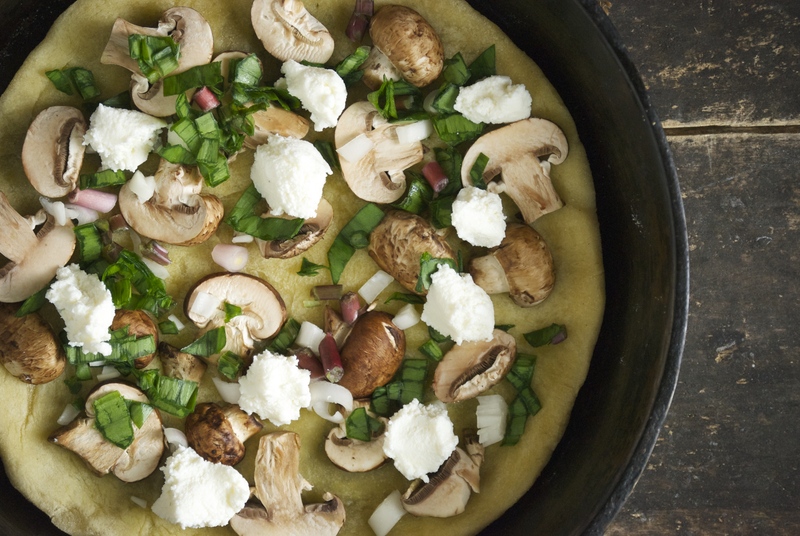 Shake off any excess flour from the pizza dough and place it in the skillet. Cook for 1-2 minutes, then flip it, adding more olive oil if necessary. The olive oil gives the crust a nice crunch to it. 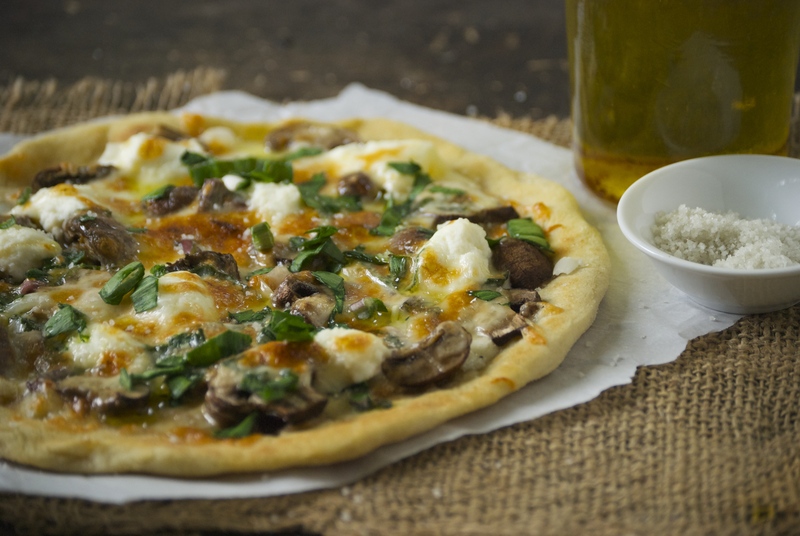 Immediately place the sliced garlic clove, a heavy drizzle of olive oil, ramps, ricotta cheese, mushroom, and smoked mozzarella on top of the pizza. Cover with a lid (to help it melt) and cook for about 5 more minutes, or until the crust is a deep golden brown. Then remove it from the stove and place it directly under the broiler (no lid) for a few minutes until the cheese is your desired color. Move the pan around, if necessary. Remove from the oven, drizzle with olive oil and a sprinkle of good sea salt. Enjoy! Spring is finally here in Minnesota! Last week I celebrated “Spring” with my kids, who had a week-long break from school. We didn’t travel anywhere, which was wonderful. It was a week full of library trips, swimming, coffee shops, board games, and a general feeling of contentment. We read a ton of books. We slept in. We stayed up far too late. We played video games (yes, I let me kids play video games, and I love that they do). We enjoyed every minute of freedom, and I enjoyed every minute of being with them. I try not to get overly personal in this space, instead opting to focus on food and all the wonderful things about it. But, sometimes I feel the need to say how proud I am of my kids. They have grown into such incredible little people. They are kind. They are hilarious. They are brilliant– and grounded. They are compassionate. I love to be with them, and that’s a pretty great feeling. Changing seasons always has me in a bit of flux when it comes to making food. Some days are warmer than others. Soup would probably still be fitting, but I don’t want anymore soup for awhile. Finding inspiration this time of year, in this particular place, can be a bit challenging. So I wait patiently– hoping that inspiration comes. It will. It always does. Ideas will pour out of my head soon enough, especially when I see the first asparagus of the season. Or smell the first ramps. I won’t be able to stop dreaming of moral mushrooms when I eat them for the first time this Spring. Inspiration will come. But, in the meantime– I will go for bike rides and long walks with my kids. We will get muddy and splash in the puddles fed by the last few melting piles of snow. I will see green emerging everywhere. 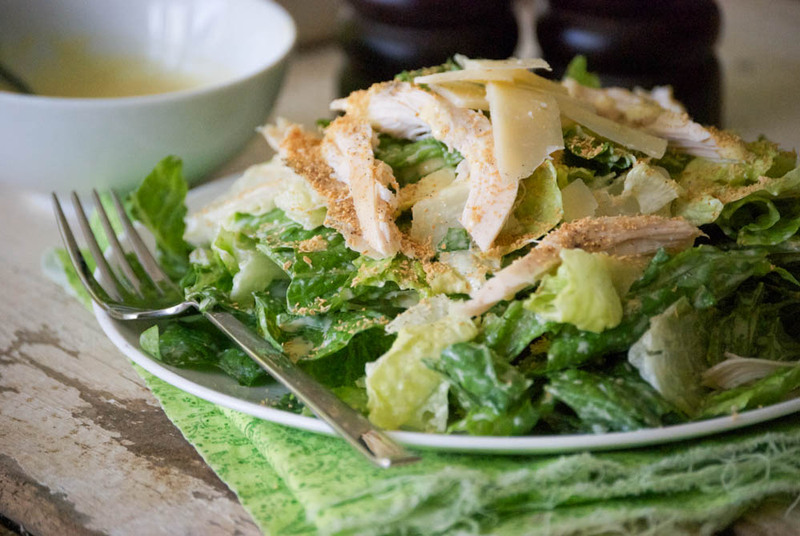 And I will eat this Caesar salad. 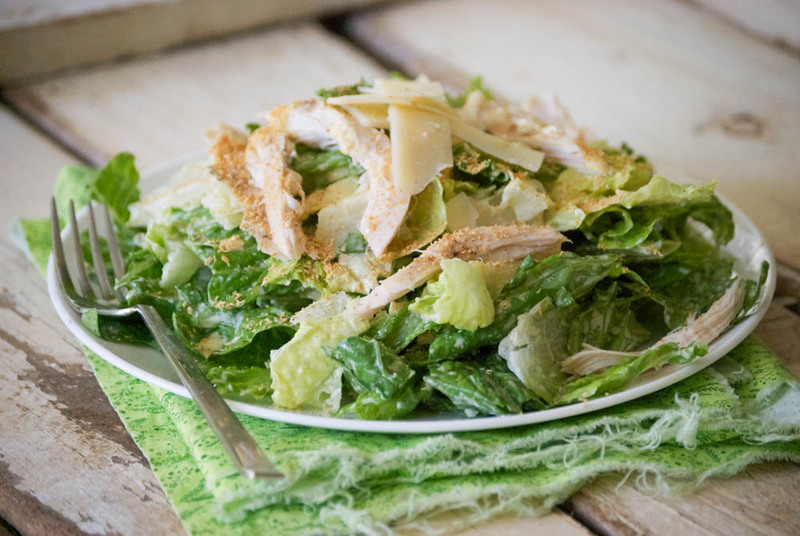 Because no matter the season, Caesar salad always sounds delicious to me. 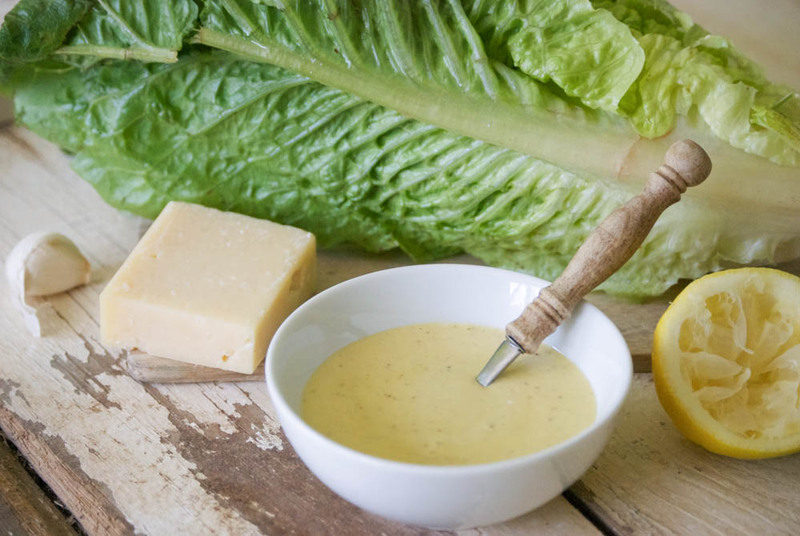 Purchased dressing doesn’t even come close to this homemade version. As with most dressings, it’s a cinch to make. 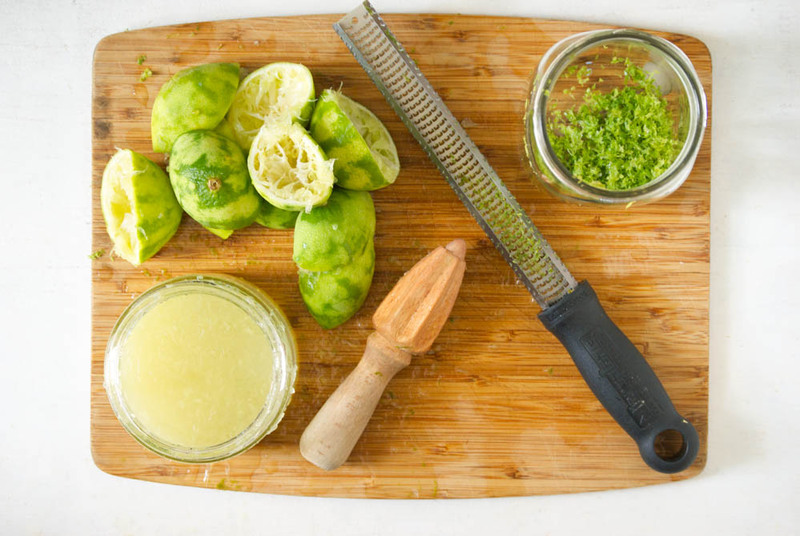 It’s as easy as putting all the ingredients into a mini food processor and whizzing it together. Serve it with chicken, if you like. Make some homemade croutons (which are also a cinch), or opt for a dusting of toasted breadcrumbs, as I often do. 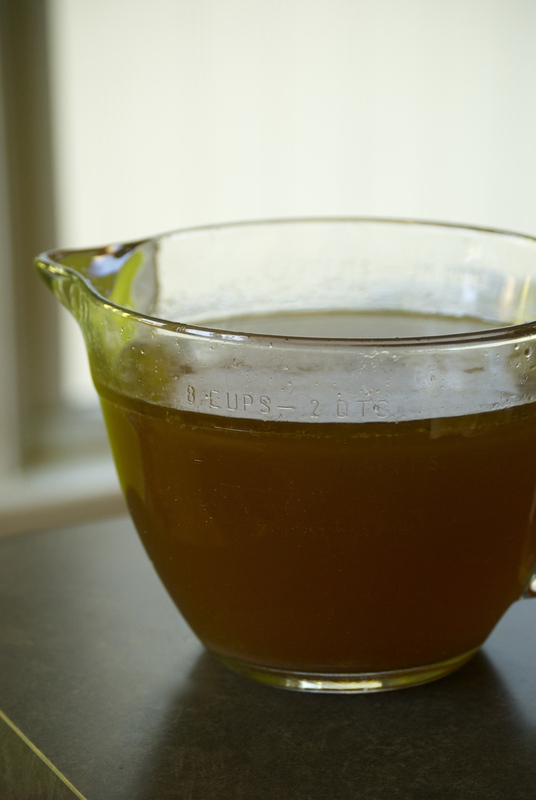 I make my dressing with a raw egg yolk– I love the consistency it gives the dressing. I use good eggs from local farmers. You should use good eggs, too. It will reduce any risks associated with using raw eggs. 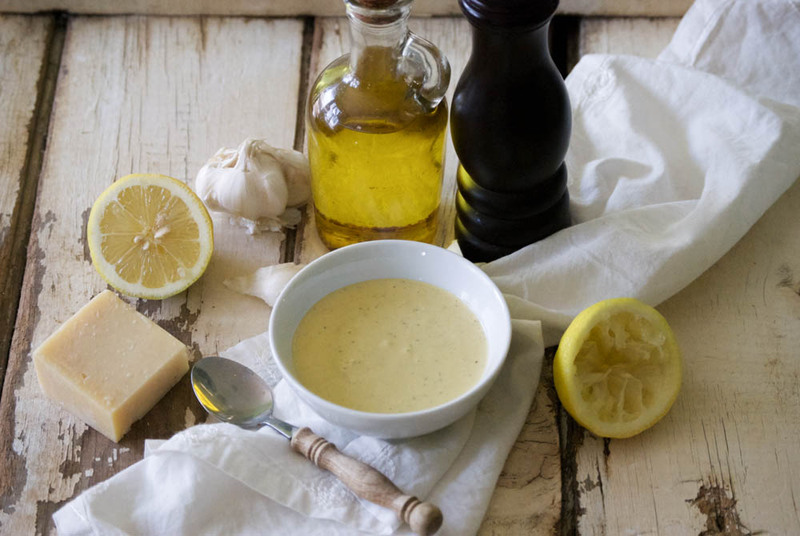 This dressing is bright and a little nutty from the parmesan. 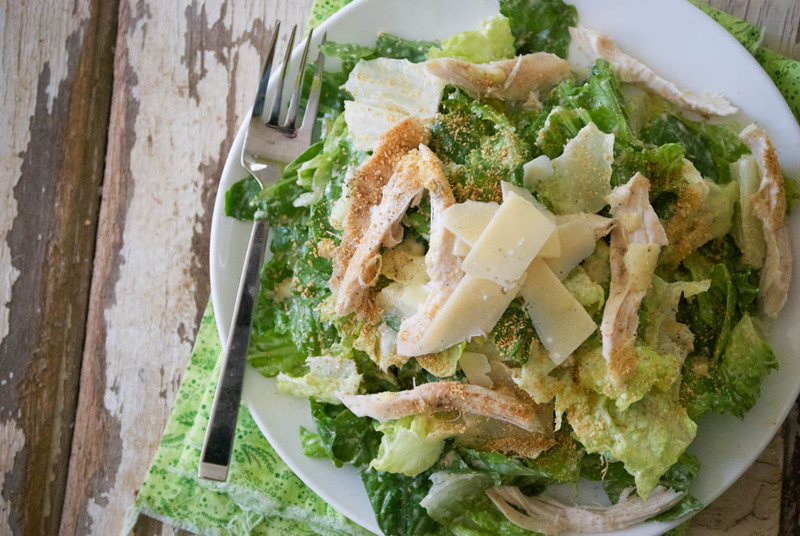 The anchovies give it a wonderful umami flavor that is a telltale sign of a good Caesar dressing. Don’t skip them, as an important element will be lost. 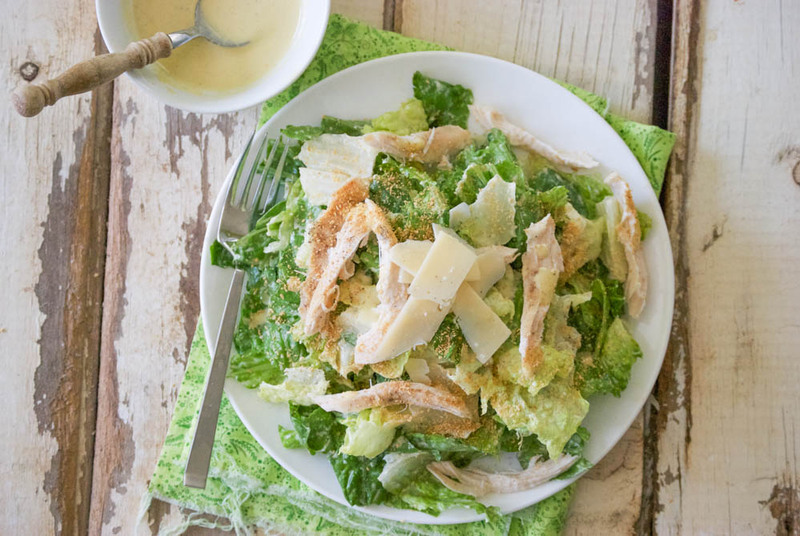 Whip up this dressing and enjoy it on a bed of crisp romaine. For added flavor, brush the romaine with a bit of olive oil and toss it on the grill for a few minutes until it is slightly charred around the edges. It adds a whole extra layer of flavor! Trust me, you’ll love it. I’ve got to fly– my daughter wants to go pick up trash around the neighborhood. True story. Place all of the ingredients, except the olive oil in a mini-food processor ( if you don’t have one, you may use a large bowl and a whisk. Just be sure to mash the garlic and anchovies into a paste first. Then, slowly whisk the olive oil into the other ingredients). It’s best to wait to season this dressing with salt until the very end–the anchovies will provide much of the saltiness that is needed. Pulse for a few times until the mixture is uniform and creamy. With the lid on and the machine running, drizzle the olive oil through the small holes on the lid. Be sure to scrape down the sides, as needed. When it is creamy and completely incorporated, it is done. Season with salt and pepper as needed. Use immediately (this dressing does not have a long life because of the egg yolks, so use it the day it is made). Enjoy! Last week my little blog had an anniversary! I’ve been occupying this small corner of the internet for three years now. Goodness time has flown by! I’m so very thankful for the friends it has brought into my life. It is such an amazing feeling to find people that share my interests– people that give a damn where their food comes from and believe that it makes a difference. Making food does more than just nurture my body, it nutures my soul. Thank you for stopping back week after week to see what I’ve been doing– I am truly grateful. 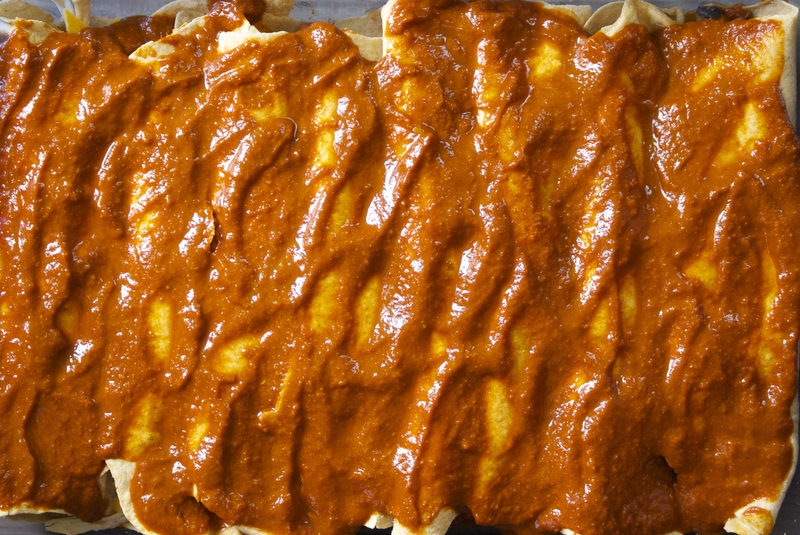 I suppose you’re expecting a celebratory cake recipe, but no, today I’m marking the occassion with…kimchi! You know I’m a sucker for fermented foods (they are so ridiculously healthy for you)– this homemade sauerkraut gets made ever month in our house. 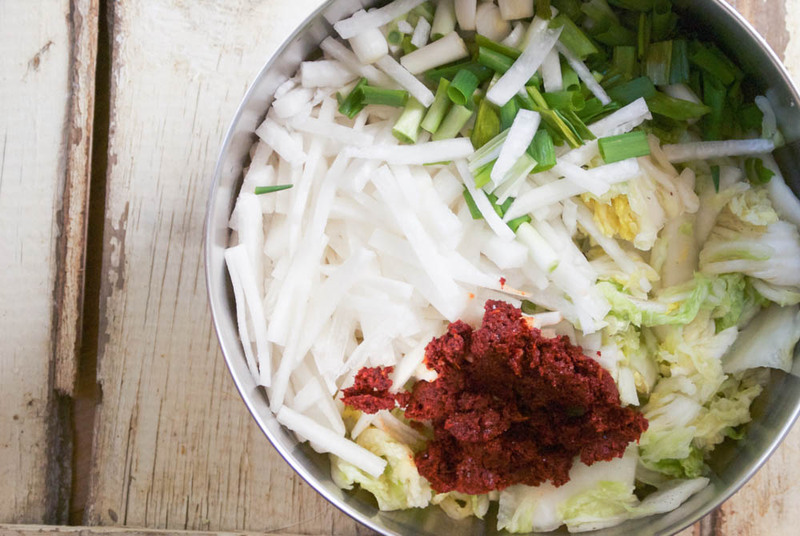 Kimchi is along the same lines– it’s also lacto-fermented– but it’s made with a different type of cabbage and a couple of other vegetables. The red color comes from a Korean ground red pepper called gochugaru. It has a wonderful flavor. Finding gochugaru can be a bit of a hunt, even in a large city. Definitely check an Asian specialty store. I found mine at United Noodles in Minneapolis. You can also order in online at Amazon. A package will last you awhile, so you won’t have to reorder very often. 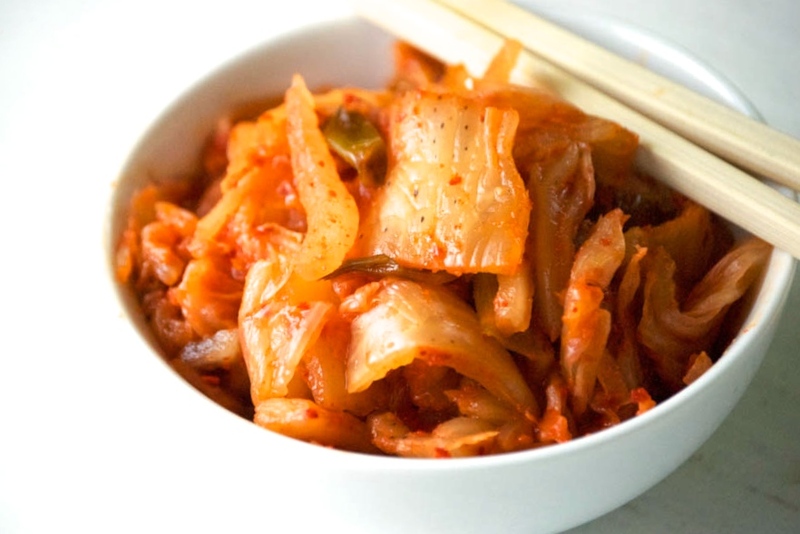 Kimchi is easy to make and doesn’t take very long to ferment. 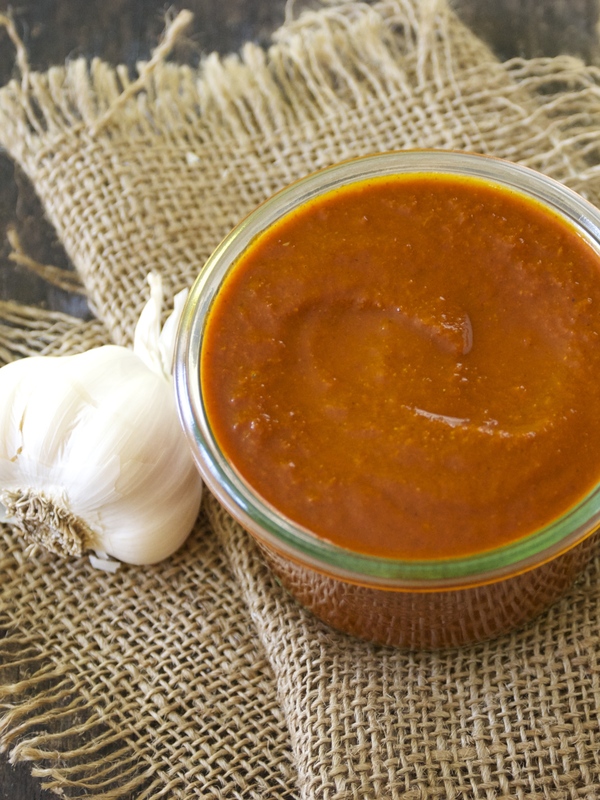 It’s as simple is mixing up a flavorful paste with garlic, ginger, and the gochugaru and tossing it with the vegetables. If you love kimchi, there is absolutely no reason not to make your own. 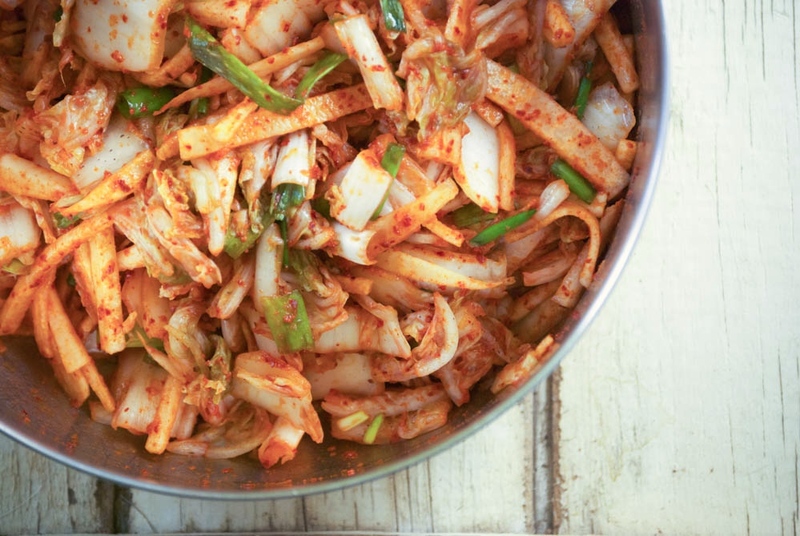 The big question is, what do you do with kimchi once you’ve made it? The possibilities are endless, really. Toss some into a batch of fried rice, throw some into your stir-fry, put it into soups, eat it with dumplings, or straight out of the jar. I love to eat it on a pizza with spicy ground pork. It adds that extra “oomph” that some dishes need. Make it. You’ll be happy that you did! 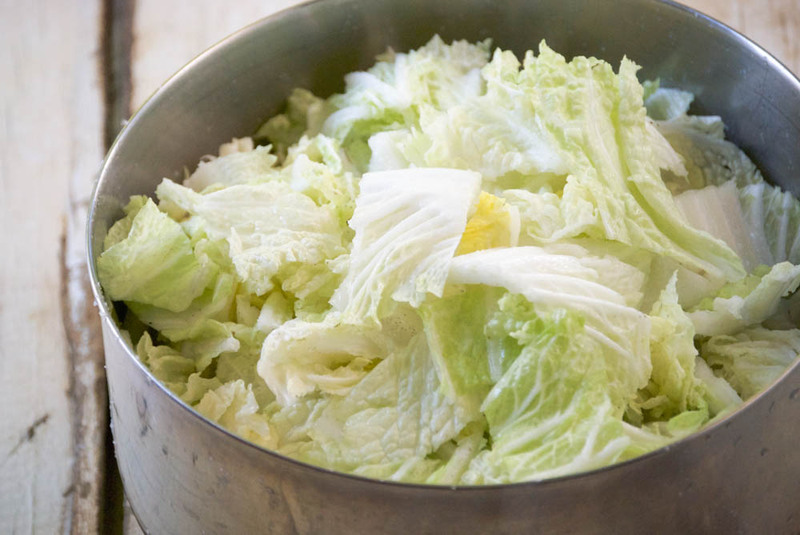 To prepare the cabbage: Place the cut cabbage in a large bowl and sprinkle with salt. Massage well so the the cabbage starts to soften and become watery. Then add enough filtered water to cover the cabbage. Weigh it down with a plate and then place something heavy on the plate. Let it stand for 1-2 hours. 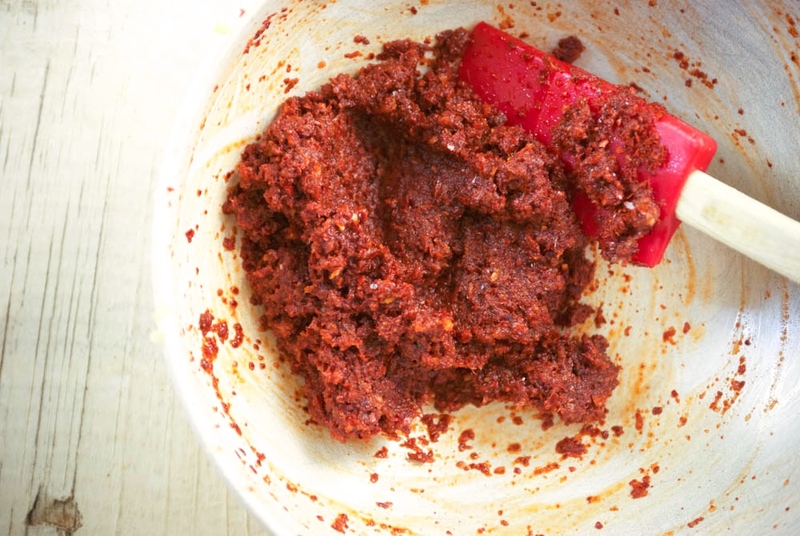 Meanwhile, make the red pepper paste. In a small bowl, add the ginger, garlic, fish sauce, sugar, and gochugaru. Mix until uniform. Set aside. 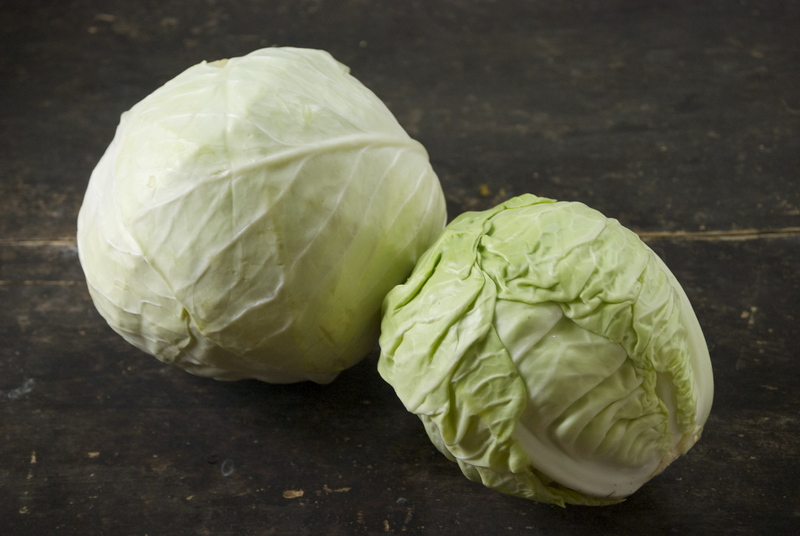 When the cabbage is ready, rinse it with cold water about 3 times. You want to thoroughly wash the salt off of it. Then drain in a colander for 15 minutes and gently squeeze out any remaining water. Return to the bowl that has since been cleaned. Add the daikon, green onions, and red pepper paste and gently mix with your hands (use gloves, if you want) to coat all of the vegetables. 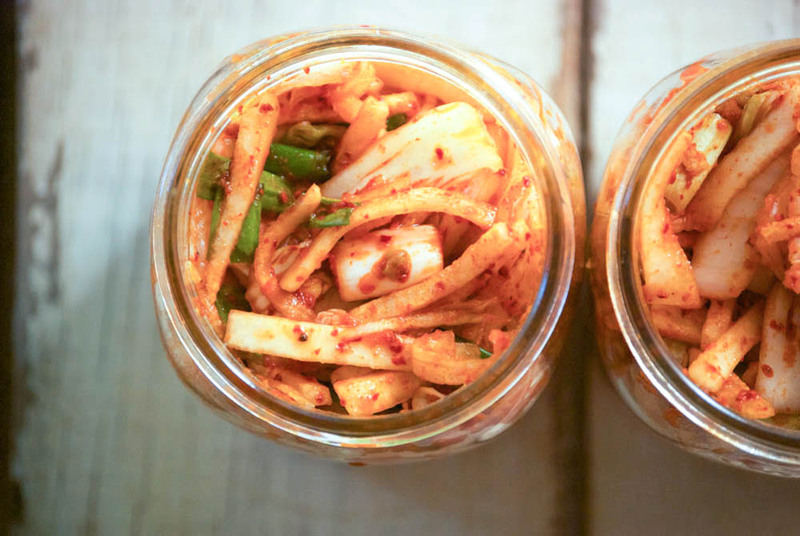 Pack the kimchi into clean jars and press down until the brine covers the vegetables. Leave about an 1-inch space at the top of the jars (you will just be shy of 2 quarts for this recipe, so space shouldn’t be an issue). Let the jars stand at room temperature for 1-5 days ( I generally do 5 days, but it’ll depend upon the temperature of your house). There may be some bubbling action and you may want to open the jar to release some of the gas, so it doesn’t bubble over and create a mess. Taste it along the way, when it is fermented to your liking, put it into the refrigerator. The flavors will continue to enhance when it’s been in the refrigerator for a while. Enjoy! I grew up in a small town in western North Dakota settled way-back-when mostly by German immigrants. Not surprisingly, sauerkraut has always been a part of my family’s meals. My grandmothers, aunts, and my mom have always made their own. 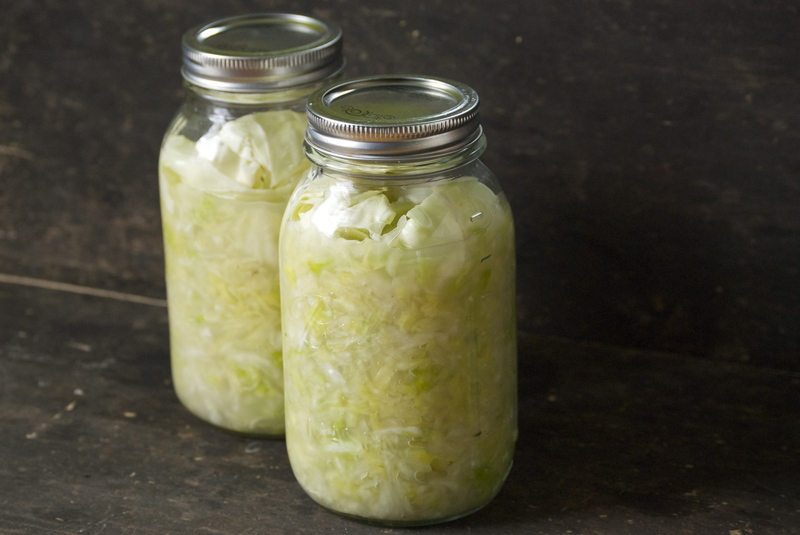 I can’t tell you how many times in my childhood I had to trudge down the stairs to the cool basement to retreive another jar of kraut from the shelves packed with canned goods. It was always there– an endless supply. I loved sauerkraut as a kid, and still do. I’m that person who orders it on pizza any chance I get. My favorite way to eat it is simply really cold, in a bowl. I like my sauerkraut to have a lot of crunch to it. I don’t exactly make my sauerkraut the same way the rest of my family does. My version tastes the same– I’ve nailed down the technique that gives that deliciously tangy and crunchy sauerkraut. But, I don’t can my batches. There are so many good, healthy things happening when you ferment food, that I just can’t bring myself to ruin those benefits by heating it up too much. Instead, I make small batches and let it ferment for a few weeks at room temperature, and then refrigerate. 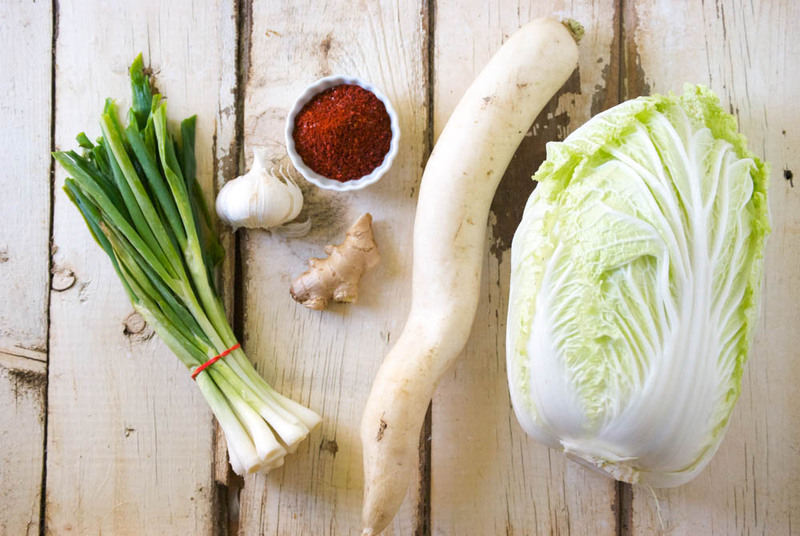 If you’re not familiar with fermentation and the health benefits, be sure to look into it. I’ve made saurkraut in a traditional crock in th past, which though seemingly fun, didn’t give me the results I was looking for. I loved the idea of the crock sitting out and fermenting for all to smell and see, but there was no crunch when it was all said and done. I’ll find another use for that crock, though. I’ve found that my sauerkraut turns out precisely how I want it when I pack it into mason jars and let it ferment on the counter for a couple of weeks. It becomes deliciously tangy and stays crisp and crunchy. Every few days in the beginning of the fermentation process, I’ll open the jar to release some of the gas. It doesn’t take long for the cabbage to take on that tell-tale sauerkraut scent. The first time or two that you do this, there will be quite a lot of bubbles and fizzing action. Exciting! After about 2-3 weeks of sitting out at room temperature, I test it out and when it’s the perfect tanginess– I put it in the refrigerator, ready to eat. Then I start another batch, and the process just rolls along. I always have fresh sauerkraut to use in my favorite dishes, such as this Rustic Potato, Sauerkraut, and Beef Galette. Or mix it into this beautiful Ham, Bean, and Sauerkraut Soup by Fresh Tart. I hope you give this a try. It’s ridiculously easy and the rewards are fantastic. 5 pounds of fresh cabbage, cored and sliced into ribbons (not too thick, not too thin). Reserve a couple of the large outer leaves to use later. 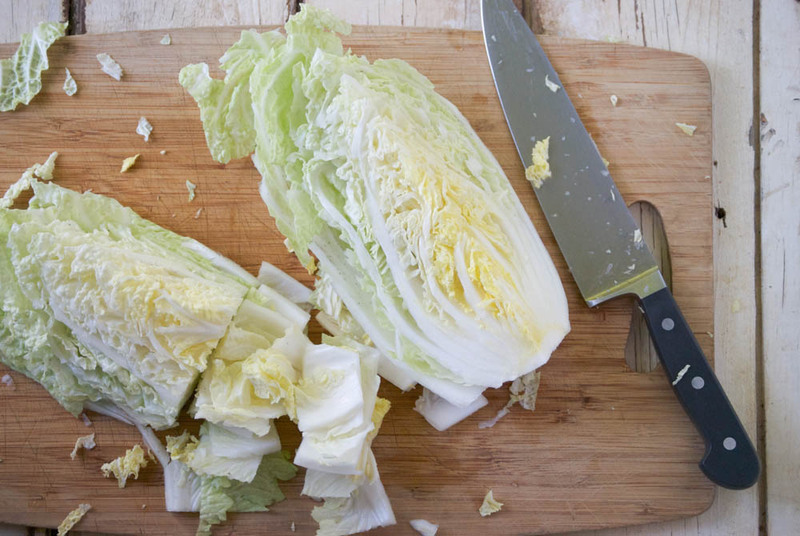 I’ve found that if I slice my cabbage too thin, it doesn’t have the crunch that I’m looking for. Too thick, and it’s awkward to chew. Using a chef’s knife works the best for me. Slice it into not-too-thin, but not-too-thick ribbons (use your best judgement and refer to the photos). 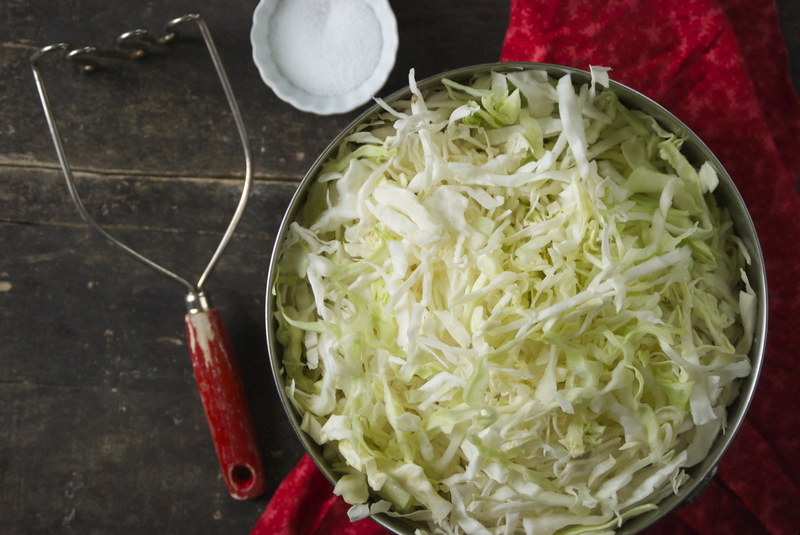 Place the sliced cabbage in a huge bowl and sprinkle with salt. 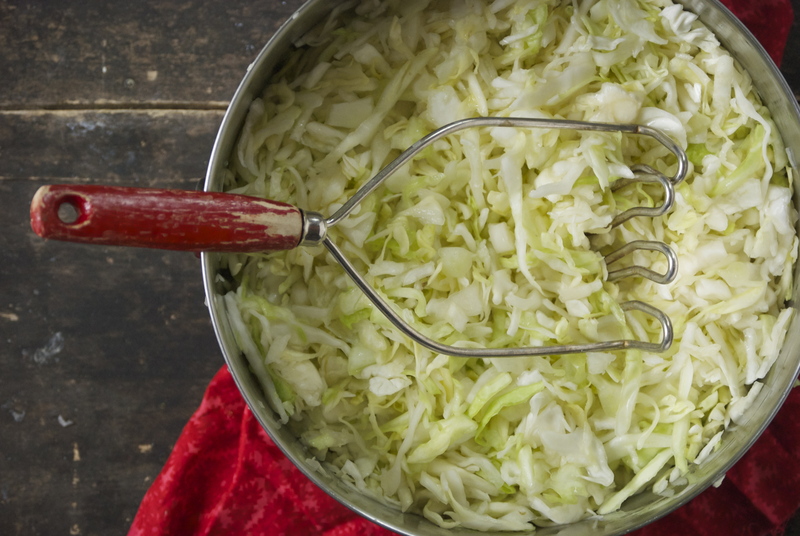 Use a masher, if you have one, to mix the salt and cabbage together. Bruising the cabbage a bit with the masher with soften the cabbage up and release some of the water from it. Inevitably, I turn to my hands and massage the cabbage and salt together. Let it sit for about an hour, or so. Keep massaging it a couple of times throughout that hour, or place a plate directly on top of the cabbage and something heavy on the plate to weigh it down. The pressure will release the water faster. There should be a pool of liquid that has formed. 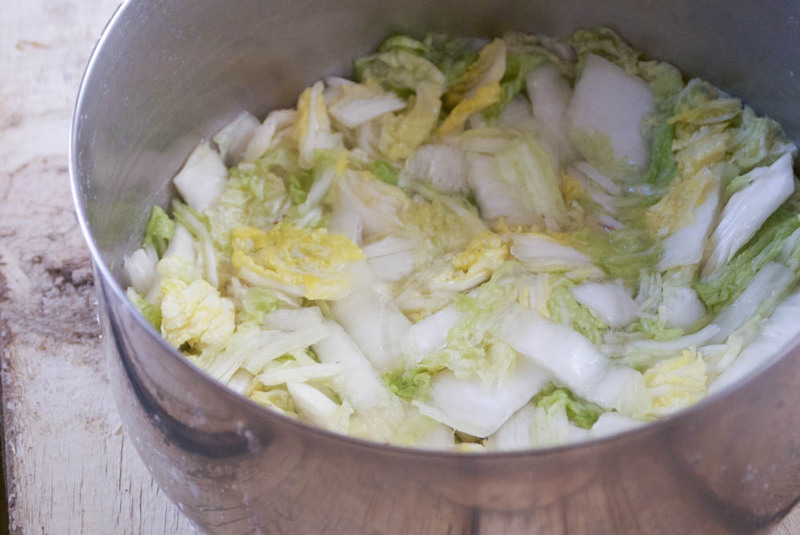 Pack it into the mason jars and push down– the liquid should come above the cabbage. 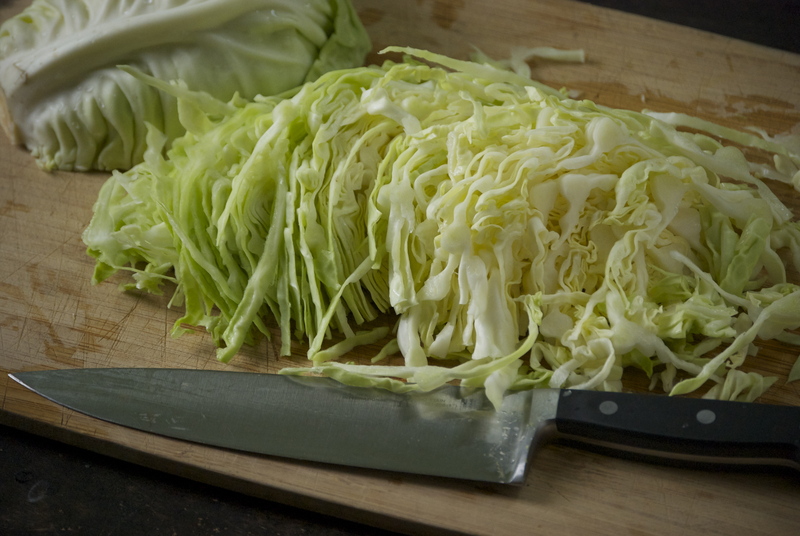 Next, fold the extra cabbage leaf and place on top of the cabbage. This will push your cabbage down so it remains in the liquid to ferment. Put the cover on the jar and wait. After a day or two, open the jar and let the gas out. There will be a lot of bubbles and fizzing action. This is good! It’s beginning to ferment. Check it again every couple of days. Occasionally, mold may form on top of the cabbage. This is fine and normal. Just scoop it out and continue to ferment. I’ve found that mold occurs more often when using the crock method, as opposed to mason jars. 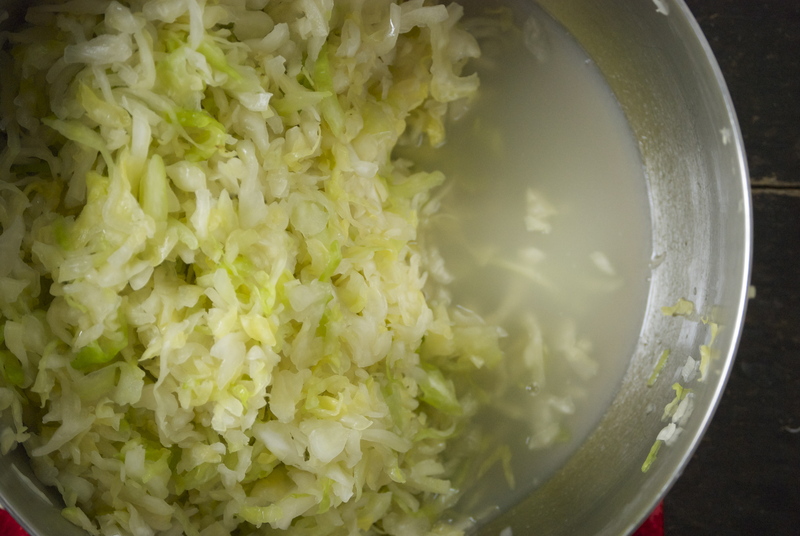 After about 2-3 weeks (depending upon how tangy you like your sauerkraut), remove the cabbage leaf and place the jar in the refrigerator to use. I’m not exactly sure how long it will last in the refrigerator, as we always use ours before it’s even a question. It should be fine for a few weeks, possibly a couple months. Enjoy!